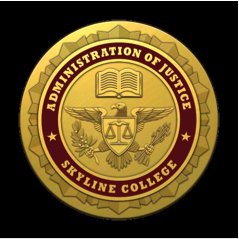 The Administration of Justice Program offers the Gold Medal Award to ADMJ students who meet or exceed the following criteria and have submitted the completed application form and supporting documentation to the Administration of Justice Program Coordinator no later than thirty (30) days prior to graduation. The medal is 2.5” diameter antiqued bronze medal with burgundy enamel, and navy and gold neck ribbon. The awarding of the Gold Medal is accompanied by a Gold Medal Certificate in burgundy display folder. 1. complete all 27 units of the Administration of Justice Certificate Program and . . .
have a GPA of 3.5 in Administration of Justice classes and have completed 15 hours or more of approved community service. 2. submit a completed ADMJ Gold Medal Application form , accompanied by documentation supporting completion of courses taken (i.e. transcripts) and documentation supporting performance of approved community service. What is Approved Community Service? Note: “Community Service” is completely volunteer service that benefits the greater community at large, not an individual, and which in no way directly benefits the student, including pay or other forms of compensation, or prospective employment consideration by the service recipient.